As stand up paddle boarders we’re free to roam and paddle free, across all stretches of water. 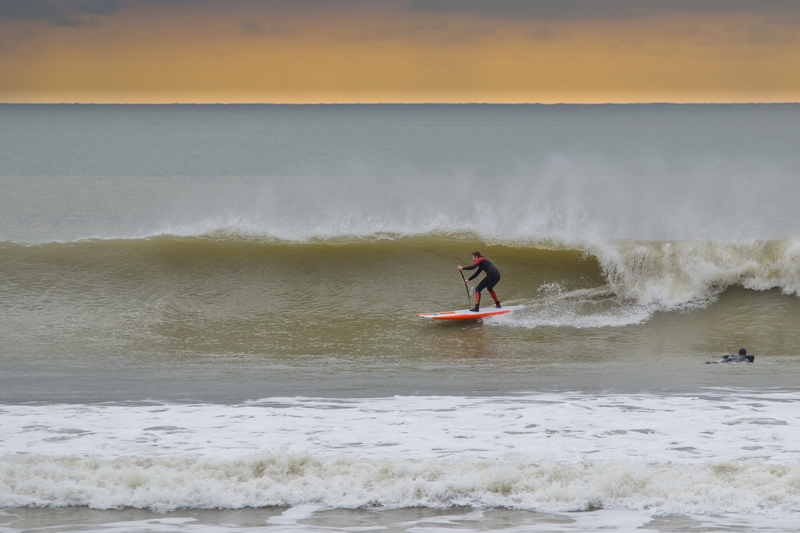 SUP’s versatility is tangible; one of the reasons it’s such a popular activity. There’s something special about simply gliding atop buttery glass smooth brine and breathing it all in. As much as we love a float, whatever the weather, you have to admit there’s something appealing and magnetic about the allure of waves. Even if you’ve never been in or don’t have the inclination to head for corduroy then we’ll bet you’ve gazed endlessly at images and vids of pros and everyday rippers tearing apart idyllic surf spots. In fact, rip and shred seems to be the name of the game when you think of stand up paddle surfing. And while this is definitely part of the sport there’s also another area. A somewhat still untapped niche within the niche if you will. Surfing went through a similar phase. Through the 80s it was all about shortboard performance and riding toothpick esque boards in macking swells – or at least quality surf. Unfortunately those of us who have to work, have responsibilities and commitments and less time than we’d like (most of us then) simply can’t associate with this type of riding. For one it takes years to develop those rip and shred skills. And you’ll need waves to do that. Heading to your nearest stretch of surfing real estate infrequently is never going to give you enough time on the water to get there. 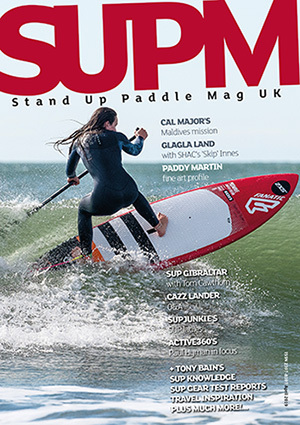 At present performance SUP surfing is a little similar. For sure there needs to be an exhibition of the upper echelons, as demonstrated by the global elite. But what about the rest of us? The fact is most will never be able to paddle sub-100L boards (nor have the inclination to). With so much chatter and media hype surrounding pumping swell, contorted moves, super small/high performance equipment and jargon/language you can’t associate with if on the other side of 25, stand up paddle surfing is in danger of disappearing up its own backside. This part of the sport, while certainly being aspirational/inspirational couldn’t be further from what most ‘real world SUPing’ is actually like. Most of us learn on something around 10ft and resembling an upscale mal surfboard. Many also take to the brine on inflatable types before progressing on to hard shell boards. In most instances riders tend to stick with similar volume, width and length boards, give or take a few inches. This will then do for flat water paddling, recreational sweeping and the odd foray into small surf. Of course there are those that will push the envelope but these paddlers are few and far between. 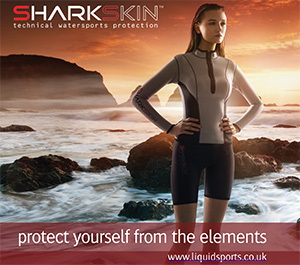 So the question is: for those sticking with their 10fter, is this suitable for longboard surfing? The answer of course is: yes it is! For longboarding riders doing battle with small to medium size waves up to around shoulder high is usual. Your trusty 10ft stick will cope with this fine. Paddlers can learn how to carve (in progressive fashion), nose ride or simply enjoy the experience of gliding along a glassy face. All of this is what we’re talking about when describing longboard stand up paddle surfing. In fairness there are a few brands who have cottoned on to the idea. And yet, the majority of what you’ll find for this type of wave sliding is still more of the all round board type. We’re sure things will change moving forwards but for now if you’re looking at a new sled for your wave shenanigans then a careful choice needs to be made. If a new board purchase isn’t on the cards then don’t forget you can always tune your vehicle for increased wave riding enjoyment. Swapping out fins is what will deliver the biggest change– as we’ve said in previous articles paddlers don’t pay enough attention to these (whichever style of board driven). Even if you only own a board with one skeg protruding you’re free to change it. Size adjustment and position in its box will give different sensations. Some you might hate while others can be super fun. 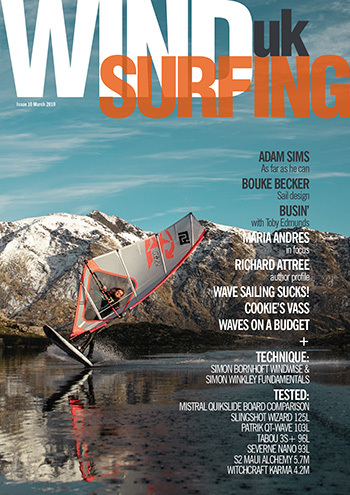 Without getting into a full on fin article we highly recommended playing around with your set up. As we’ve mentioned some brands are now manufacturing longboard surf SUP sleds. These need to be carefully looked at if you’re thinking about getting hold of one. While most will appear to be on the larger side, in terms of length, this may not transfer to on water performance – dimensions don’t always tell you the whole story. As general rules of thumb: lower volume/narrower boards will give greater manoeuvrability on the wave face – although this type of longboard SUP will require more juice to get going and greater rider input. Meanwhile wider more voluminous stand up paddle boards will give better glide and possibly allow nose riding antics. There are other design traits which will influence how the board behaves. Tail shape, volume distribution, rails, and rocker line all effect what happens when riding. Knowledge is power and we always recommend learning as much as you can. We bang on about paddles all the time so we’ll give the subject some airtime here. SUP paddles make a huge difference. Depending on your style of wave riding and type of SUP surfing you aspire to will have bearing on the weapon you choose. In any event you should be pro-active with the paddle. As light a weight type as you can find (without sacrificing quality) should be used. Shaft flex and blade style will also need consideration. Some paddle surfers prefer a softer flex whereas others appreciate the instant thrust benefits of a stiffer stick. Blades make a lot of difference as well with some brands manufacturing specific surf paddles. Unfortunately it’ll take a bit of time to understand what you need. But it’ll be time well spent so don’t avoid. Where you regularly ride should ultimately dictate what style of SUP you plump for. Be honest with yourself. If your usual lineup is a pumping hollow right hander then you’ll be looking at something to fit this requirement. There shouldn’t be any embarrassment about the type of surfing you do and where you do it. Get your kit choice dialled and you’ll still be having as much jolly as those shortboard rippers out there – more so in some instances. Due to longboards being on the larger side it’s worth making sure you have a strong surf specific leash – especially if you’re considering waves of significance. If you’re at a busy break then this is as much about safety for everyone around as it is you. For nose riding your board may have deck grip (in rare instances). More often than not, however, you’ll be required to wax or add traction. For us RSPro’s fab HexaTraction grip is a worthy investment. Not only does this give much needed non-slip it looks aesthetically pleasing, keeping your board’s graphical livery intact. You can also see from the accompanying pics we use RSPro’s rail saver tape. Again, a way to add protection and enhance your sled’s looks – performance sled pimping if you will. 14x South Coast Longboard Champion, British Masters Longboard Champion 2011, Freshwater Bay Paddleboard Co team rider and longboard SUP surfer Al Reed gives us some further insights to longboard SUP surfing. ‘With the right skills you can apply longboard SUP surfing to pretty much any wave. A long reeling point break is preferable though. Shoulder height is perfect as it gives enough space to draw out your manoeuvres. That said, I can’t resist taking my 9’11 out in double overhead reef breaks! On a longboard you draw a different line to a shortboard; carving a smooth line rather than tight shredding turns. It’s about economy of movement, making fewer more subtle turns that complement the wave. The wave dictates the manoeuvre rather than just sending it. Traditional longboards are over 9ft, and the same applies to SUP. For surfing you want as narrow as your ability allows. That will increase speed on a wave, but you also need to balance that with stability on flat water. A bit of width makes for a more comfortable overall ride. For nose riding you want the fin as far back as possible. I tend to put it right at the back of the fin box. For carving steeper waves you want it further forward to enable looser turns. The most obvious difference is having a paddle, which you can use to your advantage. It’s a brilliant tool to embellish your surfing, whether leaning hard into a wave and using the paddle as support, or pivoting on it to pull off tighter turns. You can also use it propel yourself back into the curl if the wave runs ahead of you. If longboard SUP surfing was pushed harder you’d likely get more traditional longboard surfers moving over to SUP. It seems at the moment the competitive side is all about shortboards. It makes the surf SUP side of things a bit too niche, and unfathomable for most riders. As with surfing there should be separate divisions for short and longboard SUP contests. It’s a different medium of expression and should be judged accordingly. Judges look for tight, critical turns, explosive manoeuvres and aerials. You can do those moves on a longboard but it’s more drawn out, therefore competition favors short SUPs. Longboard SUPing is about footwork. Practice moving around to see how the change in weight distribution affects it. For people that are new to SUP but want to give SUP surfing a go, spend time on flat water first and get familiar with the board. It all takes practice but by spending as much time afloat as possible you’ll progress steadily. Big thanks to Freshwater Bay Paddleboard Co. Al Reed and RSPro for all their help with this article.